Home >>Contents >>Meet The Owner! Phil Bergman is a recently retired emergency room physician at the Scripps Hospital system who grew up in a gardening family in Southern California. He became interested in palms while studying medicine at University of California, San Francisco Medical School. Soon he was traveling, meeting other palm enthusiasts and collecting seeds of rare species. Phil opened Jungle Music out of his home in 1977. This has expanded over the last forty years into a 3 acre nursery specializing in palms, cycads and tropical plants. Phil always strives to find the most unusual and interesting species for his customers. Travel around to various nurseries and you'll come to realize how unique Jungle Music actually is. Picture of Phil & son Jesse Bergman at the nursery soon after opening the new nursery in Encinitas in approximately 1995. 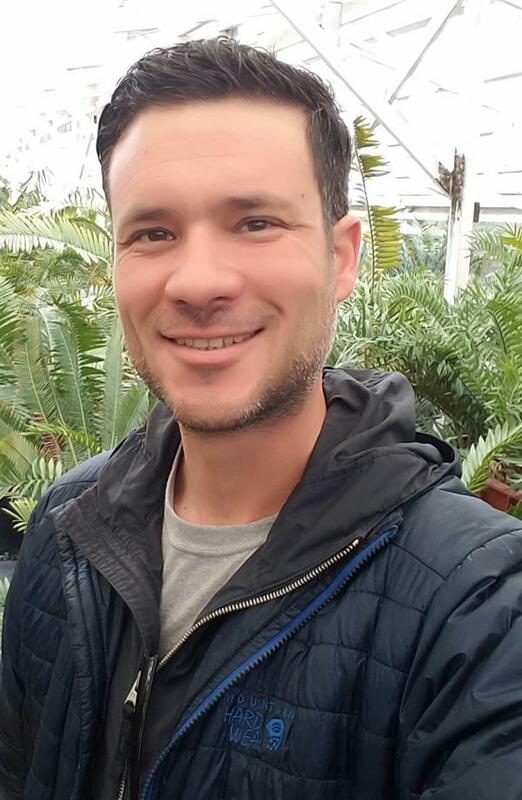 In the late 1990's Phil's son, Jesse Bergman, became actively involved with the nursery and has developed a strong interest in plants, especially cycads. Jesse has been very active in the propagation and sales division of the nursery. For Phil, it has been a great pleasure to work with his son during the past twenty years. Together they have traveled to far corners of the planet to study palms and cycads and to obtain unusual plant material and photographs for their customers. 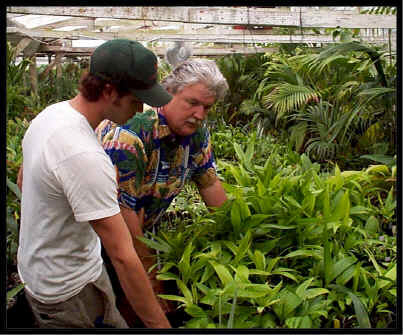 Phil has been a member of the International Palm Society for 40 years and retired as President of the I.P.S. in October 2000. Throughout his career he's been a member of the Palm Society of Southern California and is their Past-President. He's been a Director for about thirty years. He is presently serving as the area Chairman for San Diego and Imperial Counties. He encourages those people interested in palms to join both organizations. He is also a member of the Cycad Society and various other plant organizations. Phil and Jesse are both well known authors and speakers on palms and cycads. Jungle Music has been mentioned and recommended by countless newspapers, magazines, radio shows and television specials over the years. The staff combined has over one hundred years of experience in helping customers find the perfect plants for their garden and environment. Service is professional and delivery is always available. With over 1000 species offered for sale, both Phil and Jesse hope to meet many of you soon. Our nursery has expanded over the years and is presently offering an even better inventory of rare plants than before. Our facility has enlarged and now has an education center that can seat fifty people for lectures and talks. We also have a new display garden. Our 2.5 acres, is packed with plants. Our website has grown as well with the introduction of over a dozen new articles and features. We have also expanded our suppliers and work with other nurseries to find customers large crane sized material. Our selection of tropical color and companion plants has vastly improved over the past several years so that you can count on unusual items any time you visit us. Jesse, my son, has finished at UCSD and is now happily married. He has two daughters. Hopefully he will continue the legacy of Jungle Music for many decades in the future. We still have our following of loyal customers, some of whom have been with us for over thirty years. Many have masterpiece gardens with great botanical significance. And, we continue to supply plants to many well known amusement parks and botanical gardens throughout the country. This includes such well known entities as Disneyland, Lego Land, Sea World, the San Diego Zoo, Safari Park, Disney Productions, the LA Arboretum, Huntington Botanical Gardens, Denver Botanical Gardens, Missouri Botanical Gardens, San Antonio Botanical Garden and many other major institutions. We do appreciate everyone's support of the nursery. My thanks to all of you. As time has passed, our nursery has continue to grow. Jesse is more involved than ever and is doing a new website development. Keep tuned for news on this. Our inventory has expanded and we now have an off-site two acre growing grounds. Our Education Center has been used for a variety of functions including meetings and get-togethers. We're looking forward to another fruitful year and to having the opportunity to meet many new plant enthusiasts. By the way, our onsite consultation service has expanded and we've helped many develop truly remarkable gardens.